We are excited to tell you about a new challenge that we are taking on for 2016 and to invite you to be part of it! 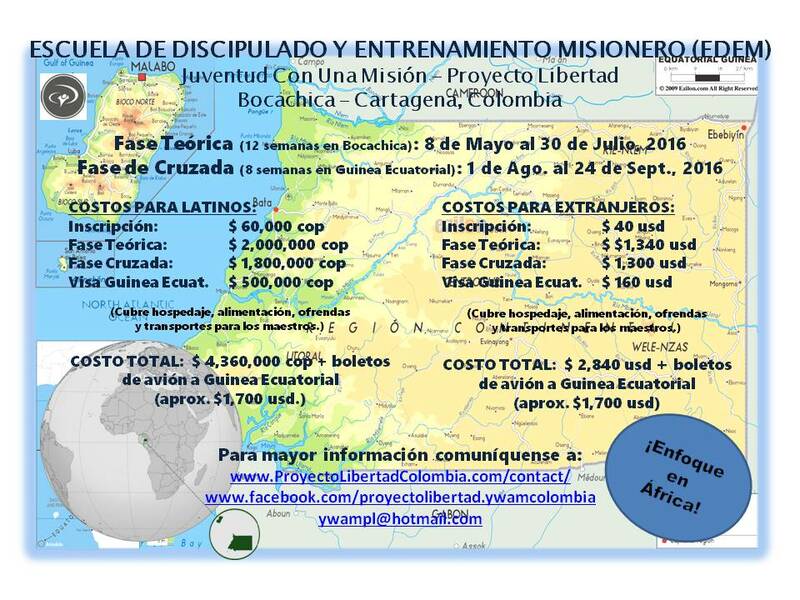 For many years we have talked about the idea of ​​one day being able to take a group of “Bocachicans” on an outreach to Africa. But, for the most part, it was just a mixture of daydreaming and talking; until last year. During all of 2014, our Proyecto Libertad Staff formed an African Alliance and met faithfully each week to learn about and intercede on behalf of the continent of Africa. Since most of the people of Bocachica are the descendants of African slaves that were brought to Colombia over 450 years ago, we always thought it would be a powerful experience to help facilitate even a few to be able to go back to their roots, to return FREE, preaching FREEDOM IN CHRIST. We talked about this idea off and on over the years; however, it was not until recently that we felt God moving the pieces of this puzzle and encouraging us to act and take steps of faith. In recent weeks, we have been meeting with the pastors and leaders of the two churches in Bocachica to discuss this project, and we have been so blessed to see their interest and eagerness to work together in unity and harmony. It is especially significant because more than 15 years ago the church experienced a painful split and this has been a source of tension in the community over the years. Now we are so excited to see what God is doing in their midst to bring healing and restoration. We are overjoyed that He has given us the privilege of participating in this new and beautiful thing He is doing! This new challenge we have accepted is to hold the first Discipleship Training School (DTS) in Bocachica with a focus on Africa, and to take our students for outreach to Equatorial Guinea, the only Spanish-speaking country in Africa. The first 12 weeks of lecture phase will be held in Bocachica at our mission. The last 8 weeks, the outreach phase, will be spent working alongside fellow Colombian YWAMer, Rubiela Vaca, who has been serving full-time in Equatorial Guinea for the last 18 years. We have also been encouraging the local pastors to consider sending their graduated students back to Equatorial Guinea as missionaries for a minimum commitment of two years after successfully completing the DTS. The following promotional poster has some basic info about the school,including dates and prices. It is in Spanish because the school will be offered in Spanish. 1. Help us get the word out about the school! If you know of anyone who is a Spanish-speaker with a specific call to Africa who would like to do the DTS, send them our way! Here is our poster in PDF form so you can share it with others: DTS BOCACHICA-AFRICA POSTER We need to have a minimum of 8 students to be able to do the school and our maximum space is for 20 students. We hope to have a full house! 2. Help sponsor our Bocachican students! Even at a special discounted rate, the $1,500 dollar school fee plus air fare to Equatorial Guinea is a pretty big mountain to face! However Matt. 21:21 says: Then Jesus told them, “I tell you the truth, if you have faith and don’t doubt, you can do things like this and much more. You can even say to this mountain, ‘May you be lifted up and thrown into the sea,’ and it will happen.” Help us throw those mountains into the sea!! Click here for instructions on how to donate! We as a staff have started a fund especially designated for air-fare and so far we have $1,200 dollars saved! That’s almost enough for one ticket already! Visas! Our friend Rubiela told us that the biggest mountain we would face would be the approval of the visas! This is a process that involves bureaucracy, egos, power-trips and spiritual forces of darkness. Finances! We have tried to lower the price of our school as much as possible to make it more accessible to Colombians and Bocachicans;however, in this economy it is especially difficult to come up with such a large sum of money. The teachers who will come to teach in our school. Over the next few months we will be inviting our teachers, and putting together the curriculum and weekly schedule. May God guide us and orchestrate every detail to bring the people He has chosen for this task. The staff who will lead this school. May God bring God-fearing people of integrity who are passionate about discipleship and mentoring and who lead by example. Thank you for sharing in this challenge. We can’t do it by ourselves! UPDATE: Sadly, our plans to hold a DTS with a focus on Africa had to be canceled due to a lack of committed missionary staff and major health issues (Soon after making this post Karen Silva from YWAM Proyecto Libertad and Rubiela Vaca from YWAM Guinea Ecuatorial were both diagnosed with breast cancer). Previous PostOur WeekNext PostMaintenance Man SOS! Thanks so much, Donna!! We so appreciate your prayers and support! !